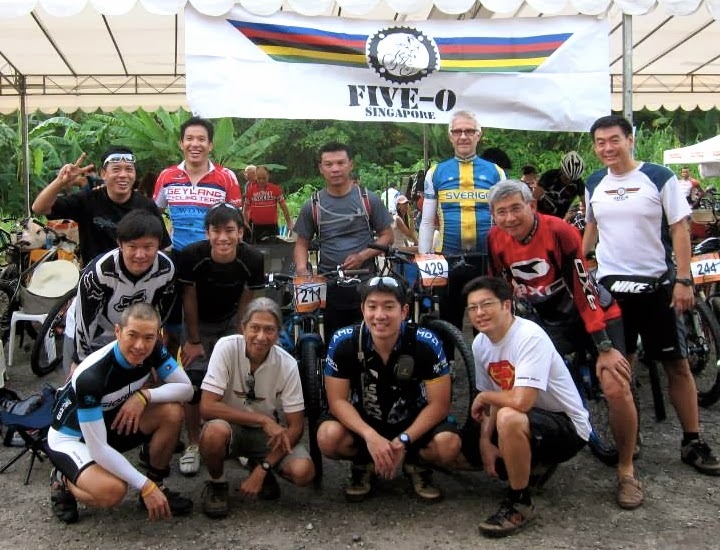 This is the first time in memory that a mountain bike race was held at Lorong Asrama, a restricted military training area north of Singapore. Kudos to DirTraction for pulling off this feat. The trails consisted mainly of loose stone trails designed for heavy vehicle training, with some twisty and technical downhills through foxholes. The foxhole sections were fun but quite challenging because they were preceded by lung-busting climbs. I raced in the Men's Solo category and the format was to complete as many 8.1 km laps as possible within 8 hours. Most of the trails except for the foxholes were not covered by trees and so the temperature peaked at 39 degrees at around 1 pm. I completed 14 laps, my first and last 3 laps being the hardest. And what a mental and physical torture it was, especially after being ravaged by massive cramps in the thighs from lap 9 onwards. The final 14th lap came unexpectedly ... as I triumphantly passed the finish line with 10 minutes before the 8 hour cut-off time, spent and with tears in my eyes from the pain, the race officials gestured that I could go for one more lap! So what the heck, one final excruciating lap. My final statistics - 6th place out of 62 participants, 117 km distance, 2,600 m climbed and 4,700 calories burned. I must admit that this was one of my toughest race ever and Strava confirmed it at a massive 374 "Epic Suffer Score". Never-give-up!